Collecting American Arts and Crafts furniture in the early 1970s was simple and straightforward. You searched and searched and searched, and when you were lucky enough to find, say, an actual piece of Gustav Stickley furniture, you’d buy it, almost no matter what. Unless you tallied up the expense of driving many thousands of miles year after year, it didn’t cost much money, because in those days almost nobody wanted that furniture. Established antiques dealers looked down their noses at such 20th-century “junk.” By about 1980, though, prices for Gustav Stickley furniture began their inexorable rise, and since the late 1980s they’ve occasionally reached stratospheric heights. During the first years of the 1970s there was other Arts and Crafts furniture you searched for, too, mostly Roycroft, L. & J.G. Stickley, Stickley Brothers and Limbert. On the East Coast, we combed New York State for the work of Charles Rohlfs. Others hunted for the decorative designs of Frank Lloyd Wright and, on the West Coast, a handful of collectors sought Greene and Greene. Beyond those, a few large-scale makers were known then, for instance the Michigan furniture firms Lifetime and Luce, the Cincinnati-based Shop of the Crafters, New York’s Joseph P. McHugh and a smattering of others. But beyond these re-emerging names lay a baffling terra incognita of unidentified furniture that collectors, dealers and auction houses came to label “generic mission.” While it’s unlikely that we’ll ever know exactly how much of that furniture was made, for 10 or 15 years it poured out of American factories in huge quantities: A 1908 industry survey, for instance, listed 148 manufacturers specializing in “mission furniture.” Though often it was pretty scrappy stuff, many pieces were well designed, solidly constructed and nicely finished. Clearly there had once been a number of manufacturing firms, their names long lost, that had produced this furniture with considerable care. For many modern-day Arts and Crafts enthusiasts, this vast landscape remained unknown territory until the pioneering husband-and-wife team of Michael Clark and Jill Thomas-Clark ventured into it about 1988. When they began collecting in earnest, they knew, as art historians and researchers, that they could not long be satisfied with such a vague designation as “generic mission” for the furniture turning up at country auctions. They needed to learn more about this little-explored landscape and its inhabitants. Perhaps providentially, it was an unusually well designed and beautifully made slat-backed armchair they found at a local auction in 1988 that provided a case study, as it were, for their education. J.M. Young furniture was attracting a few collectors by then because it offered a Stickley-like level of craftsmanship at less-than-Stickley prices. But little was known about it. Who was J.M. Young? When did this firm produce Arts and Crafts furniture, and how much had been made? And what had become of the company? As the first step of their research into J.M. 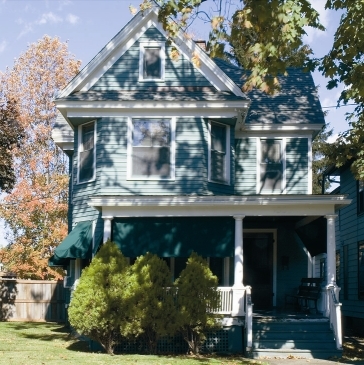 Young, Jill contacted the Historical Society of Camden, N.Y. She immediately experienced one of the incredible strokes of good luck that seem to come most often to dedicated and resourceful researchers: the woman she reached, one of the society’s volunteers, knew the firm well because her husband had been its last owner, and- astonishingly- she still had its surviving records in her possession. Just before the old Young factory was to be demolished in 1979, she and her husband had retrieved as many of the firm’s papers as they could find. They packed them into cardboard boxes and stored them away, hoping that someone, one day, would consider them important. They also retrieved other crucial details of the shop’s Arts and Crafts work, including records showing the dates when specific armchairs, rockers and tables were first made, how many of each model were sold and when they were dropped from production. (Among their discoveries was that the chair that had started it all was a #1916 armchair, made in 1927.) And, intent on gathering the kind of direct, firsthand insights that can’t be gleaned from business papers, they found and talked with the factory’s few surviving workers and befriended J.M.’s grandson, Gordon. Studying those dusty documents and arranging personal interviews gave the Clarks an intimate view of the firm’s day-to-day operations during the years-a surprisingly long span of them, as it turned out-when J.M. Young & Sons made Arts and Crafts furniture. In 1994 they shared their discoveries with other collectors and scholars in their first book, J.M. Young Arts and Crafts Furniture, still the definitive source of information on the firm’s work. John McIntosh Young, they had learned, was a Scottish immigrant, a woodcarver who opened his furniture manufacturing business in 1872, in Camden, about 30 miles northeast of Syracuse, and began making elaborate Victorian chairs, tables and cabinets, along with more utilitarian, bread-and-butter furniture. His was a small, family-run enterprise, with J.M. and his sons busy each day in their factory alongside a workforce of some 12 to 14 men. The Clarks’ research revealed surprising and significant facts about J.M. Young. 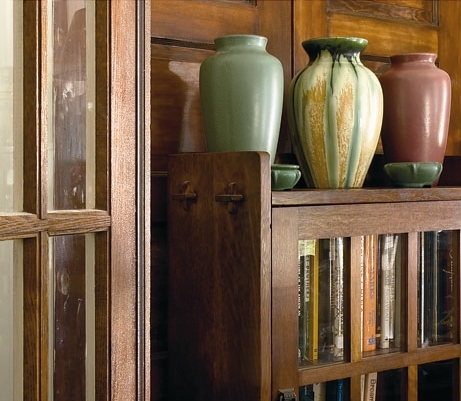 They learned that when Leopold Stickley’s company stopped making Arts and Crafts furniture, about 1922, he at first filled orders from stock on hand, then turned to the Youngs to replicate several of his most popular models and recreate his fumed finishes. In other words, some ÒL. & J.G. Stickley furniture- was in fact made by J.M. Young. Young continued manufacturing these designs on a limited basis into the 1940s-startling evidence that in some instances “mission” furniture making continued much longer than is commonly believed. Today, Jill and Michael are not just scholarly chroniclers of J.M. Young. They are ardent collectors who’ve filled their home with the firm’s best Arts and Crafts furniture, a unique collection their passion for research has helped to shape. Who Made All Those Brown Oak Lamps? The Clark home is also the showplace for another of their passions, a large collection of “mission” table lamps-about 50-that has grown out of their exploration of the mysteries of Arts and Crafts lighting. A common sight in American homes a hundred years ago and frequently seen in collections today, these lamps are mostly straight-lined, made of quartersawn oak stained brown, and have varicolored art glass shades, occasionally leaded but often not. Yet as familiar as these lamps are, their origins have long perplexed collectors. Though some were evidently shop-class projects produced by students and others the efforts of amateur woodworkers, most were clearly factory made. As Jill and Michael discovered, the forgotten Mr. Brown created light fixtures that were “designed and constructed to blend harmoniously with the total Arts and Crafts environment.” In Style 1900 they wrote that he used “efficient design and production methods” that made his stylish lighting affordable and “easily shipped in great quantities.” Brown’s factory relied on machine power to mass-produce table lamps and ceiling lights, but the products were also marked by handcraftsmanship of its highly skilled staff: “the artistry of individual workers,” as the Clarks wrote, “remains evident in each fixture.” Like J.M. 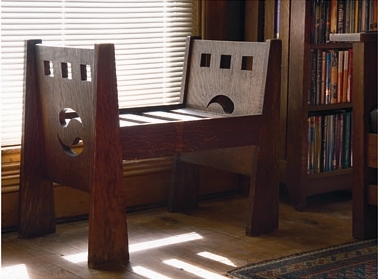 Young and the other Arts and Crafts furniture makers uncovered by their research, Brown helped popularize the movement and brought its “modern” idea of simple design to a large and appreciative middle-class market. A book on Arts and Crafts lighting, focusing on Brown and many other makers, will be the Clarks’ next project. These pioneering scholars and collectors hope in the years ahead to devote even more time to the Arts and Crafts subjects that matter to them most. “We write only what we want to write,” they told me. “It is a labor of love.” Though they live mainly with J.M. Young furniture and W.B. Brown lamps, they also have a “study collection” stored in their attic. I haven’t had a chance to explore that attic, and I’m curious: just what, exactly, is up there? And, whatever it is, who designed and made it? One day, I expect, the Clarks’ ongoing labor of love will produce more answers.